Another spring day, another severe thunderstorm watch. This one’s in effect until 8 p.m. and covers Spotsylvania, Culpeper, Stafford, Orange, King George, Greene, Albemarle, Nelson, Madison, Page, Rappahannock, Augusta, Highland and Rockingham counties in Virginia, as well as the cities of Fredericksburg, Harrisonburg, Staunton, Waynesboro and Charlottesville. A severe thunderstorm warning for Carroll and Howard counties expired at 5:15 p.m., and the scattered storms had mostly moved out of the area by then. Most of the rain Tuesday afternoon was south of Washington. 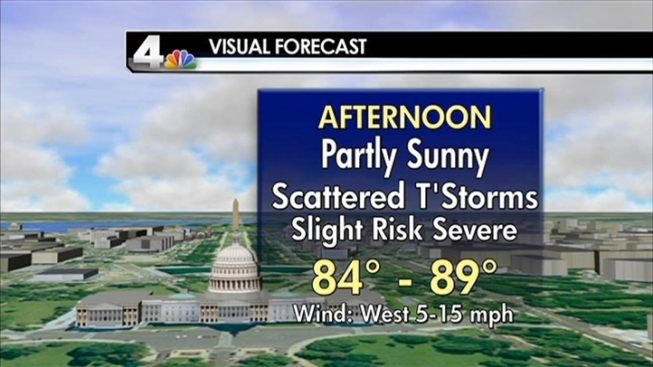 NBC Washington meteorologist Doug Kammerer anticipated the thunderstorm watch being canceled before 8 p.m. A few more showers are possible at about 8 p.m., but they will not be severe, Kammerer said. They should be out of the area by 11 p.m. There's a chance of showers Wednesday afternoon, but most would be south and west of D.C. and again, they are not expected to be severe. Expect highs in the mid-80s and mostly sunny skies.